Join the discussion on our forums! Come discuss Second-Rate Bruiser over in our dedicated Second-Rate Bruiser discussion topic. He'll be a first-rate bruiser once he gets used to his contacts. Anything with 4 attack is pretty solid against priests too. Not that priests are usually in the habit of running a board full of minions. 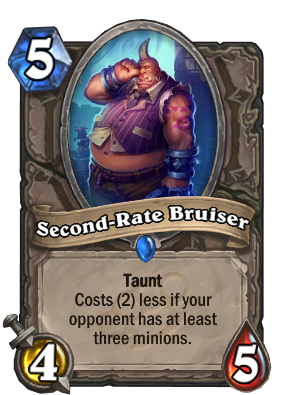 TIL that if you draw this card with Bright-Eyed Scout the cost is fixed to 5 and the discount of 2 does not work at all no matter how many minions your opponent has. I feel like this is not intended, and i hope it gets fixed. See, this is the kind of tech needed to make Buff Pally work. Unfortunately there's not enough. I'm wholeheartedly happy about the fact that this card became very playable. This is what tech cards should be! Finally! we need more cards like this to create aggro counters. Feels like this card should simply have been 6 mana / "Costs 1 less per enemy minion" to make it an interestingly useful card in many circumstances. Well, you got your Rabble Bouncer now. I feel like this card is going to fit in some Rogue decks. Well i was expecting the same with Nerubian Prophet actually, which despite not being played on constructed, it turned out to be a preeety good card for Rogue in arena. Since Rogue has a potential to have huge tempo turns, same goes with this card too. A silly example: Rogue going second, shaman going first. Turn 3: Totemic Call vs Second-Rate Bruiser, Backstab Tunnel Trogg, hit it with the weapon. There you have a huge board lead. This might not look like a strong example but actually happens a lot. also it is a good counter against Tunnel Trogg -> Feral Spirit since it breaks the curve for shaman. It can kill almost all early game minions in the game, can kill Barnes, Totem Golem, Azure Drake, Flamewaker etc... and the most important thing is, it can be played on turn 3. it is good. Amazing counter to zoo and token, and slightly aggro. But requires them to be 70% of the decks you run into. So a midrange meta will make this kind of card useless. I see it as a 3 mana counter to hand spam, if they play 3 minions in one turn, most likely they will all die to this card so it could easily be 3 for 1, for 3. Tech card against Zoo, aggro paladin/hunter, brings memories of Deathlord as counter to early flood decks. Probably one copy to counter if meta continues to rely on small difficult to kill minions. Regular stat line is below average for mana cost which is a shame, rather see it with 1 more health and we would be talking extra value here (being too careful not to replace druid of claw is not doing any favors, that card still has added flexibility). Bring on the Taunt Warriors. I wonder if someone is gonna make a Taunt Warrior deck styled around the Chess Boss Battle with cards like these. That would be so cool. Evolve helps (Play this at 3 mana, evolve it into a Cairne Bloodhoof), and Rogue can potentially cast it for 1 mana after killing a minion. Not to mention that having three minions isn't that hard; Most Shaman aggro decks will usually have a Totem, Totem Golem, and another minion minimum on any given turn. You could also evolve this into big-time racketeer or moat lurker. Still pretty good though.